Sunset Campout 2011 – Here We Come! We are nearing the final days of preparation for an annual event that is very near and dear to our hearts, and WE ARE SO EXCITED! We’ve literally been conceptualizing and designing for the Sunset Campout since the beginning of the year. Anne’s packed. I’m packed… well almost finished. We are ready! Are you? Anne and I have both been attending Sunset parties since the late 90’s. In fact we first met outside on the pier before a Sunset Boat Party back in 2001. The Sunset Campout is where I started doing public altars, and Anne started collaborating with me on them when the event started up again in Belden, CA. Being part of it, and being given the opportunity to express ourselves in the way we do means so very much to us. We are eternally grateful. With each year we always aim to take things to new heights. This year we’ve decided to embellish the Faerie Tents a bit more and make it into a Faerie Ring. We also recently blessed each of the tents on Summer Solstice with their new names. Temple of Aine and Astarte’s Veil. Aine is Queen of the Faeries. Astarte is the Queen of Heaven and her veil is the cosmos. We’ve designed these places as sacred spaces you can go to connect with others and have some chill time but still be central to the party. Also on the lawn this year will be a Meditation Pyramid, a Wishing Bowl, and one of our new creations The Faerie Looking Glass. Be sure to check it out, it’s a magic mirror! Beyond the Faerie Ring we’ve got some cool new things planned for the altars this year. I dare not tell you though, I’ll just say I had a vision in a dream and one of the altars is the manifestation of that dream. This year we are also very excited to be collaborating with Minx from Radiant Atmospheres on the altars, and Intrinsic who will do the flowers. You might remember Intrinsic’s flower creations from the Sunset Boat Parties and this year’s first Sunset park party. Timmy Herrlein, who along with designing all the DJ booths, is building us something for the altar from my vision. We are really looking forward to seeing it all come together. Now Galen, Solar and J-Bird have been very hard at work organizing and planning the event. I know because every time I talk to them they are having another meeting. They have some new features to the parking and gate entrance which should make for a smooth and fun entry. Get ready for the magic party bus! Try to pack as light as you can though, it’ll make for an easier entry and leaving for you. As with any Sunset party you go to, they have a fantastic production planned. Stepping it up each year is also part of their agenda for the campout. When you are at the party you can’t really imagine how they could take it up a notch from the year before but they pull it off every time. So if you thought the other years were rad, just wait! Anne and I can’t wait to dance our booties off. I’m sure you’ll see us on the dancefloor more than once. 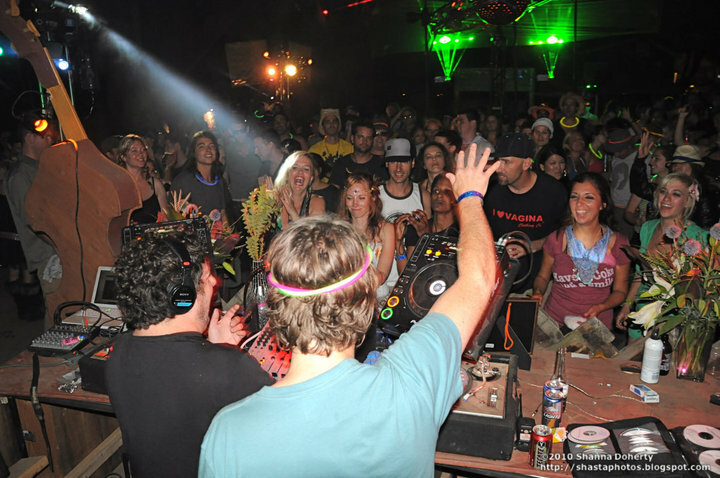 Check out Sunsetcampout.com for the list of DJ’s and bands. Know: Audio is once again providing their super sound. Every year I profess to Radiant Atmospheres & Coil, UV99, and Slide & Spin how their lighting, lasers and visual magic have blown my mind so I can’t wait to see what they have in store for us this year. I have no doubt in my mind I will say the same thing after all is said and done this year. Healer Goddess Lois is back with her Sunset Rejuvenation team of massage therapists, juices and face painters. She has some of the best therapists in the city there with us. I’ve had work done by Lois before and what she did for me was extremely healing and exactly what I needed, so if you have a chance to get a massage from her or someone on her team I highly recommend it. Ursula Xanthe Young has been doing double time with being a new mother and planning all the Live Art and Display with the help of Krescent Carasso. 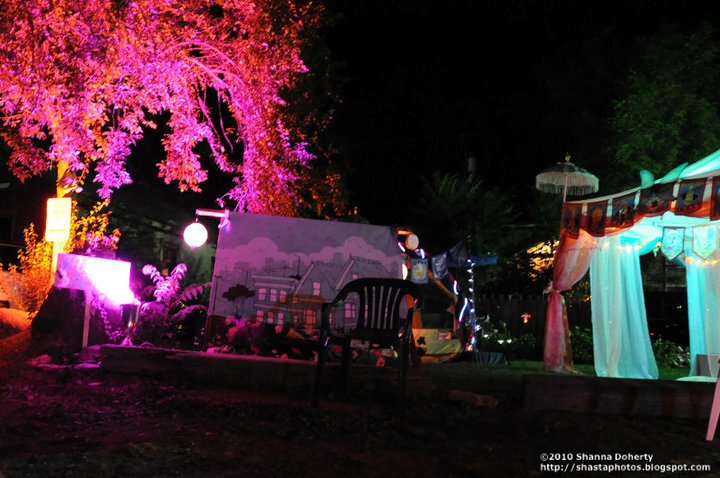 This year there will be an onsite art gallery displaying work from each of the artists next to the Faerie Ring. Krescent is also displaying her visual magic on the beach at night again, so be sure to make your way to beach at night as well as in the day. For more info on the Sunset Campout and all it has to offer please be sure to check out the website Sunsetcampout.com. There is some detailed important event information on it you should read. Now before I sign off the Faeries want me to remind everyone about the trash. Please don’t piss them off. Remember you need to take your garbage with you. Belden town doesn’t want it. When it’s time to leave we know we are all tired, but it’s important that we clean up after ourselves. Take your floaties with you, try to find that one shoe you are missing from the pile, don’t leave your cups and bottles on the altars, DJ Booths or Sound System, and if you smoke don’t throw them on the ground. We don’t want to pick them up after you. Mother Earth loves you. Show her how much you love her by keeping her beautiful!